Villian is a young guy who is playing well and pushing action at this limp-fest. He is talking to the older guys at table about position, GTO stuff, etc. Seems knowledgeable and wants people to know he is knowledgeable. Pre-flop action: Villain opens $13 UTG+1, folds to me, I defend. Pre-flop analysis: This is a 3b candidate for me at times with K-blocker, but I do not want to build the pot up, OOP, against someone who quite honestly is probably a better player. Flop analysis: This flop hits my range much better than his. I have more of the sets, 2-pair, combo draws. Plus, I think he fires a c-bet most of the time since he likely faces little resistance against other opponents who under-defend. My plan is to check raise turns I pick up equity or lead river on most run outs that he checks back the turn. I tend to float when OOP on boards that favor my range. 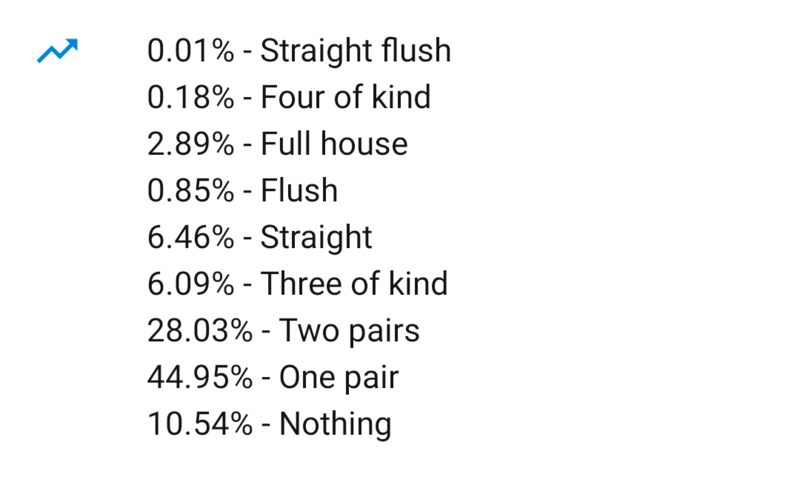 Turn Analysis: I suspect he is double barreling with draws that he picked up on the turn (straight draws) or draws he has had since the flop (flush- but I do block some combos holding the Kd). I think his value double barrel range is Top-Top +. I pick up SDV by getting 2nd-pair with strong kicker. My plan is to call most blank rivers if he fires a reasonable bet size. River Analysis: I just think he has too many bluffs here and I only have to be right 27.2% of the time to be +EV. Even if he bluffs just a few draws (JQ, AQd, AJd, A9d, A5d, A4d) and value bets (AA, KK, QQ, JJ, TT, 99, 77, AT) that is still 33.3% bluffs that I beat. I think he shows up there with more bluffs though including more Axd, KQ, KJ some percentage of the time. Villain just sat down at the BB. No information on him, generic 30-40 something white guy who bought in for full $400. Pre-flop analysis: I do not like calling this hand and I prefer to play in position heads up with a decent hand where I take the initiative. Flop Analysis: I have position and a range advantage so I am c-betting at a high frequency here. When he calls though I think he likely has a pair, so I am probably not barreling unless I pick up some equity on the turn. Turn Analysis: I pick up equity with the inside straight draw and I continue to have positional and range advantage. He has not check-raised yet so I suspect I am against single pair hands and maybe some draws. If he did hit I big hand I suspect he will lead into me some percentage of the time either here on the turn or on the river. River Action: Villain checks, Hero bets $125, Villain fold. River Analysis: I have no show-down value and I have to continue to story and fire triple barrels here. It worked this time, but in the long run is it +EV at these stakes? I have gotten some feedback that I play too aggressively and get too sticky on the river at times. These are hands that I consider "standard plays" in my arsenal; however, I think that I have to be introspective in poker and realize that what I am doing may be strategically flawed. I submit this to you all for feedback since most of you have a vast amount more experience/knowledge. Any constructive feedback, positive or negative, is welcomed! Hopefully it is not as surly feedback as Villain in hand #1! Neither of these hands should have seen a flop. This would be a fine defend in Hand #1 preflop if the Villain was raising from the button, but definitely not UTG 1. Hand #2 just isn't strong enough, even when attacking limpers. For the K9o hand, lets assign JQo as the bottom of his range and say that he is only opening 9.5% which I suspect is tight for this particular player, but let's make that assumption (Range 66+, AQo+, AJs+, KJs+, KQo+, JQ). The K9o has 34.2% raw equity against that range. The direct pot odds are 37% (10/27), so I can see where that is a poor play mathematically. 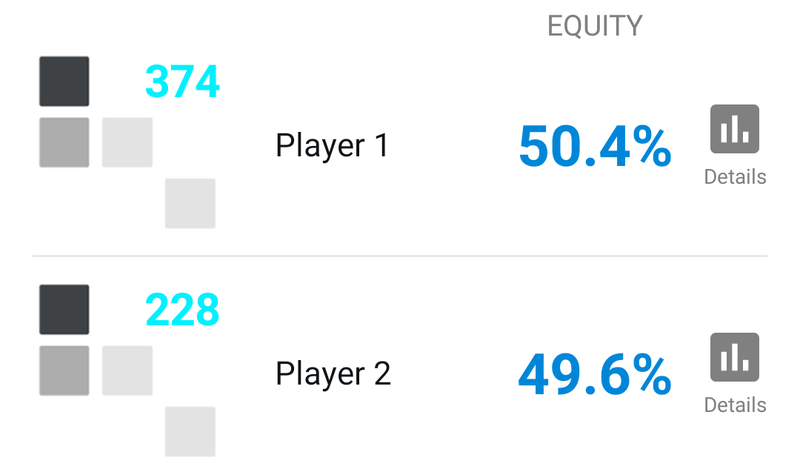 Furthermore, I concede that I am going to drastically under-realize that equity which is why I actually think that I can put this in my 3-bet range some percentage of the time with the K blocker. I also realize that this is a hand with reverse implied odds. However, the MDF is 63% (17/27) so I have trouble justifying folding 75% of my range if I am folding K9o. I feel like I have to play my range of hands similarly and defend a wider amount given the MDF. Perhaps I am conceptualizing MDF incorrectly and applying it incorrectly? I do think that maybe I should either 3-bet or fold here though now I am analyzing it more because it is a hand that is going to play poorly against this particular range with reverse implied odds. Thank you for bringing this to my attention. In terms of the Q9o hand that is a hand I am going to play from the button with a mixed strategy pending on the profile of the limpers as well as the SB/BB. The SB was not going to 3-bet me often and the BB was an unknown 1/3 player that I assume is not going to 3b the BB often. The limpers were folding often pre-flop to raises and playing fit-or-fold on flop. If I can play in position, I am comfortable when playing post-flop that I think that I will make it profitable. 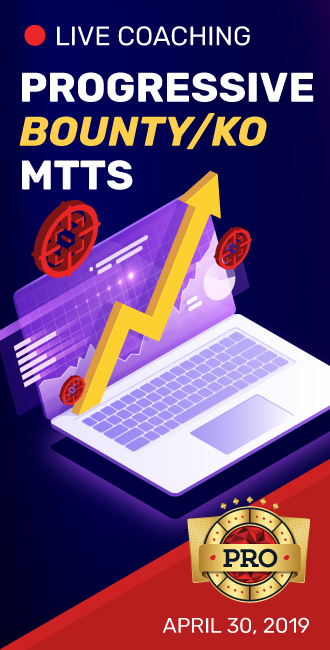 Including Q9o is ~opening 25-30% of hands pre against the 2 limpers (MP). I open about 40% of hands from the button so I am narrowing down my range to adjust for limpers. I play a very aggressive style when in position. Is there a mathematical error when I attack limpers with Q9o or is it that we have stylistic differences in our approach. Are you saying that Q9o is too wide because it undeniably is or because it is in conflict with your strategy which I assume is much tighter pre-flop than I employ? If it is a poor strategic move please expand so that I may understand why and I can consider re-adjusting some of my overall strategy. You are applying MDF incorrectly in your above rationale. V is risking 13 to win 3, so it needs to work 13/16, or 81% of the time if he wants to exploitatively make this play with ATC. This means that at least one player behind him needs to find a call 19% of the time to keep him from exploiting the whole lot of you. I think between the 6 of you, you can muster up that much defense. It's important to note that the onus is distributed amongst everyone, not just the final player if no one has continued. I also think it's important to note in your second hand that if you are opening as loose as Q9o over multiple limpers, I do not think you have range advantage over a BB flatting range on a AJ7 board. His range is going to contain a lot of Ax, but yours contains a lot of additional chaff. Thank you for very much for taking the time to explain that. I literally just folded K9 versus MP in BB because of this. I'll tighten up more against limpers too. Appreciate the input. This makes more sense now, I've def spewed off a lot of BB given my misunderstanding of MDF! Would you fold the Q9 here or would you ever overlimp? Hand 2 is completely fine from a theoretical perspective. Personally, I would not barrel the river at these stakes, but that's an exploitative play, and it's theoretically fine to triple barrel here (although I think a losing EV play at low stakes). Even opening 40% of hands, you definitely do have a range advantage over BB here, contrary to what Roblivion says. 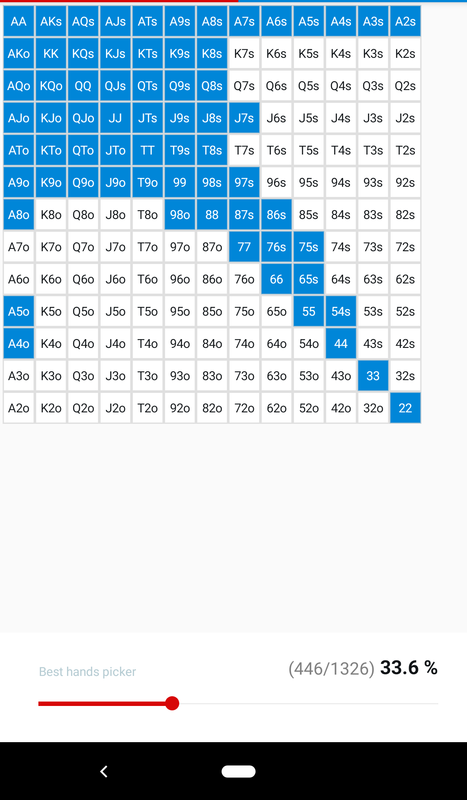 If these two hands are relatively standard for you and you seriously consider 3betting K9o from the BB, you could almost certainly increase your win rate by tightening up. @Phil Ebbs I'm curious how you're ranging BB. I made some assumptions and quickly ran the below ranges through an app on my phone. This is about as loose as I felt comfortable assuming an unknown flatting range. I set AKs and AKo to calling 50%. With these two ranges, equities are about 50/50. It also provided this breakdown by hand strength, which I assume is on the river after more cards come out, since it includes numbers for made straights. This looks more range neutral to me, though if I tighten the BB range more and loosen the button range more, it begins to swing more to BB having advantage. 1) I don't understand your strength breakdown, since it gives full house probabilities, and boats aren't even possible on this board. 2) The key range assumptions here are that BB should almost never ever show up with AA, JJ, AK, AQs and AJs. When he doesn't have these and doesn't X-raise flop, he is extremely extremely capped. I don't understand what hands you have BB 3betting here. Are you saying he 3bets QQ+, AKo and AKs 50/50? If so, that is ridiculously too tight. 3) raw equities is not a good way to look at bluffing frequencies. Here's a quick toy game for you to think about. Imagine you raise and I call in BB, and the board comes 258r. You can now choose between one of two ranges, and I will get the other range: Range 1 is [QQ,KK,AA], Range 2 is [44,55]. Which one of those ranges in equilab shows higher EV? Now, given 3 streets of betting, which range would you rather have? Like I said, I don't quite understand either, but I assume it's taking into consideration all possible turn and river runouts and giving percentages on river based on that. Unfortunately, not quite as useful as just showing what hands are made on the flop. That is why I asked about what range assumptions you are making about the player in the BB. I made assumptions based on what I've seen in general 1/3 player pool population. I think the average player 3-bets QQ+, and often just flats JJ and AK. Further, I think hands like AQ and AJ are almost always going to be the heart of his BB flatting range. 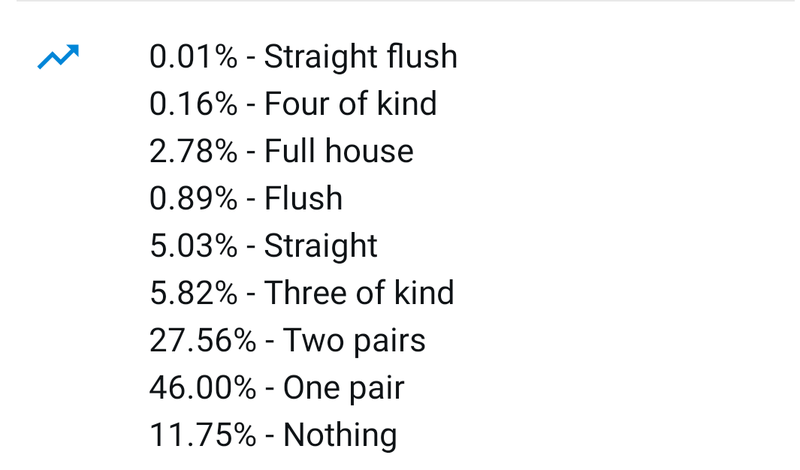 As far as not x-raising flop, that's a different story all together - I am simply talking about whether button has range advantage on the flop. B.) I think BB's range has a larger percentage of nut hands than button's. Obviously, the more combos added to the button's range, the more dilluted it becomes. If we strip out some of those Q9o, K9o opens the percentage of nut hands on this board goes up and then I start coming around to agreeing we have range advantage. So, like I said, I think it is primarily a difference of range assumptions. What sort of range are you giving an unknown 1/3 BB flat? OK, so I think we agree to just ignore the app equities and hand strengths. As you correctly say, the question is who has the proportional nuts here more often. There's no question that a remotely competent player would be 3betting hands like AK and JJ here. You can make a player pool assessment and say that you think a random 1/3 guy is going to be so incompetent that he slowplays these huge hands. That's fine, and at that point the discussion is over and it's up to OP to assess his villain's range. 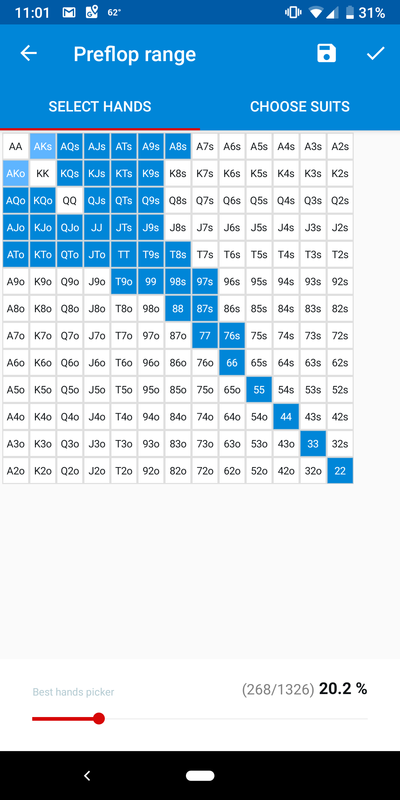 Frankly, I have played in very few 1/3 games where I think that the majority of the pool would not 3bet JJ or AK to a button open, and I would be extremely hesitant to assume that about someone on whom I have no reads, but obviously I do not play in the same games that you play in. As for a button flatting range, I think estimating it at 40% is a reasonable assumption. If your 1/3 players are slowplaying JJ, i'm willing to bet that they are calling any suited king, Q7s+, and all suited gappers. Heh, yeah it appears we play in some pretty different games. If you're assuming a 40% defense, I absolutely concede that button will have range advantage whether BB 3-bets JJ/AK or not. My plan is to check raise turns I pick up equity or lead river on most run outs that he checks back the turn. I tend to float when OOP on boards that favor my range. I think its problematic that we have a plan here but dont follow through with it. According to our plan this should be a check raise. Whether or not a c/r is good here is up for discussion.... But having a plan and not following through in real time is the same as not having a plan. Do you think 40% is unreasonable? If you are playing in games where BB is calling HU less than 40% and they are 3betting you 2% of the time, you should be 3xing literally any two cards. FYI, with the calling range that you give BB in your example, you auto-profit by 4xing on the button with literally any two cards. I mean, seriously, is that the flatting range of the BB where you play? If so, then why are you opening up your button so tightly? In your example, the BB is not even making min defense frequency, and somehow the button knows the BB is horrible but hasn't adjusted yet by widening up his range...? Doesn't seem realistic. This is not a heads up pot where the button opens 4x. This is a pot with two limpers where the button opens 6x. In that case, yes, I think BB is probably defending about 20%, which I think is fine since the limpers will often come along and button range will be somewhat tighter for the same reason. I only advocated folding Q9o pre when there are already two limpers. If we're opening, I'm raising this hand all day. If you think the BB is making that adjustment, then that's fair. We can debate player pool tendencies all day, but I don't know if I've ever seen a low stakes player tighten up the bottom portion of their range in the presence of limpers but play the upper end of their range so badly. Also note that Q9o is a slam dunk open if we only get 3bet 2% of the time. it was never a "slam dunk" anything.